I am very aware that some women (and their partners) worry about breastfeeding in public and in front of family members. If this is an issue which concerns you, I hope that some of these tips will help you to feed your baby confidently and comfortably when you are out and about. whether there is a Breastfeeding Welcome Scheme in your area? If you find a venue that offers a particularly warm welcome do tell your friends and upload the details onto Feedfinder by using this link. You baby will need to feed when you are out and about. 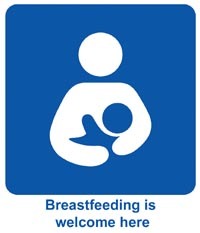 The Equality Act 2010 supports your right to breastfeed in any public place. The Act includes the following point that if a member of the public comment or complain about you breastfeeding in public it is for them to remove themselves from the situation, not you. The more women who breastfeed in public, the greater understanding the public will have about breastfeeding being the normal way to feed a baby and the more acceptable breastfeeding in public will become. For more information on Breastfeeding in Public please visit Breastfeeding on returning to work and study - Information for employers and employees, students and course providers Page 16-17.